With this year’s Maths Week currently engaging over 370,000 people of all ages on this island, it’s worth pausing to note that it’s been 175 years since William Rowan Hamilton really put Ireland on the maths map by inventing quaternions. This is a four-dimensional number system with a highly usual property as the order in which two quaternions are multiplied makes a big difference. We all know that two times three is the same as three times two, but quaternions do not follow this "commutative" rule. This breakthrough came to Hamilton on October 16th 1843, as he walked with his wife Helen from their home at Dunsink Observatory along the Royal Canal towards a meeting at the Royal Irish Academy which was then on Grafton Street. 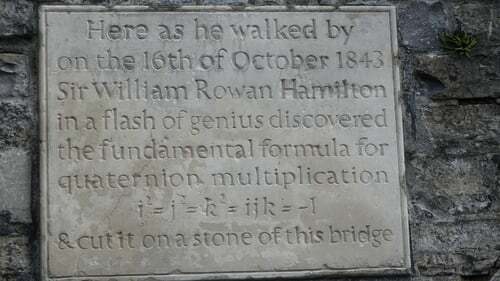 Famously, he spontaneously carved the corresponding key new equations, which he’d been struggling for some time to come up with, on Broom Bridge in Cabra. Although no trace of his original act of minor vandalism remains, a plaque commemorating his flash of insight has been there since 1958. It was unveiled by then Taoiseach, Éamon de Valera, himself a lifelong fan of quaternions. The bridge attracts celebrities all year around, including Fields and Nobel winners and government ministers, especially for the annual Hamilton Walk. The Hamilton walk was started 28 years ago by Professor Tony O’Farrell, and has been spearheaded in recent years by his colleague at NUI Maynooth, Dr Fiacre Ó Cairbre. This event, retracing Hamilton’s steps each year, ends with a celebration at Broom Bridge and has been running since 1990. Some refer to it as Broomsday, as it comes exactly four months after Bloomsday. O’Farrell and Ó Cairbre received the 2018 Maths Week Ireland Award for Raising Public Awareness of Mathematics in recognition of their vision and hard work in promoting what is now an iconic international mathematical heritage tourist destination. There are not many spots in the world that can be identified with a spectacular mathematical breakthrough at a specific location and on a particular date! So what was the big deal about quaternions back in 1843? It was that for any two quaternions x and y, x times y and y times x are not the same. Today we say that "x and y do not commute". Nothing like that had been seen before for numbers. Matrix multiplication, a different kind of generalisation of number multiplication, is also non-commutative, but that wasn’t conceived for several more decades after Hamilton's breakthrough. Order makes a difference in a lot of things in life: from putting on your socks and shoes (try putting on the shoes before the socks and see how that works out), to using a €10 off coupon as well as a 50 percent off one (try using those in both possible orders for a €200 purchase). However, the order in which two numbers are multiplied, such as 12 times seven versus seven times 12 should make no difference. In the end, it all depends on what kind of numbers you are using. Real numbers commute, meaning that x times y is the same as y times x for whole numbers, fractions, and numbers with decimals which don’t repeat (like the square root of 2, or pi, the area of a circle of radius 1). By the 1840s, mathematicians were feeling more comfortable with the broader concept of complex numbers, numbers of the form a + bi where a and b are real numbers and i is a magic new kind of number (sometimes unfortunately referred to as "imaginary") with the extraordinary property that its square is -1 (a surprise since squares of real numbers are positive). Complex numbers, like negative numbers and fractions before them, were initially viewed with suspicion, but gained acceptance as they turned out to be very useful in solving real-world problems and they are used today in many applications in physics and electrical engineering. They can be added and multiplied, just like for numbers in the earlier more conventional number systems, and the order in which either operation is done also makes no difference. Complex numbers are two-dimensional in a sense and what Hamilton first tried to do was extend this idea into 3-dimensional space. He was motivated by geometry and physics, but he failed because it turned out that it’s just not possible. However, adding one more dimension opens up a whole new vista. There is a 4-dimensional world of numbers in which we can add and multiply, and it’s an extension of complex numbers. What Hamilton also showed was that this new concept could be applied to ordinary 3-D geometry, especially the study of rotations. While many of the other quaternions applications he came up with were in time superseded by the vector calculus developed at the end of the 1800s by J. Willard Gibbs and Oliver Heaviside, quaternions have returned to the limelight in the past half-century in ways that would have been unimaginable to their creator. A recent Irish Times piece recounted the use of quaternions in solving a "gimbal lock" problem on the Apollo 11 mission, as well as an application to electric toothbrushes. Most importantly, while rotations in 3-D for computer animations have long been represented by matrix multiplication, it turns out that "unit" (length 1) quaternions work too. They are much more efficient when vast numbers of calculations need to be done speedily. The original 1996 video game Lara Croft: Tomb Raider used quaternions to deliver convincingly smooth 3-D rotations. Pixar Animation Studios uses quaternions too. "We use them in our Inverse Kinematics and Skeleton code, for example", explained software engineer George ElKoura . "We also use them in camera manipulations". The quirky multiplication can also be explored in a purely fun context via a new "Hamilternion" card game. Hamilton’s quaternions provide a splendid example of how a seemingly abstract mathematical oddity forged from intense human curiosity and determination later led to powerful applications in the digital age.